A return to firmer footing is the key to Kiwi mare Rondinella’s chances of snaring New Zealand’s first win in the Group 1 $2m Schweppes Sydney Cup (3200m) in 16 years. Robert Wellwood (left) and Roger James (Pic: Trish Dunell). That’s the view of 24-year-old co-trainer Robert Wellwood who was rapt with her Australian debut third behind Avilius on a heavy track in the Tancred Stakes two weeks ago. 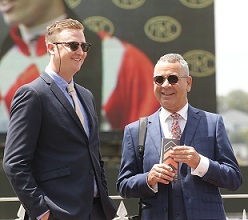 Wellwood, who entered a training partnership with Roger James at the start of this season, said the improved forecast and her last start effort were encouragement to stick around and tackle the two miles at Royal Randwick. “She races a lot better on top of the ground so we are going into the race with a good chance,’’ Wellwood said. “She’s got a great action and on the rain affected tracks she just can’t move the same. The last New Zealand-trained winner of the Sydney Cup was in 2003 via Katrina Alexander’s four-year-old mare Honor Babe, who started favourite and gave Kerrin McEvoy his first Sydney Cup win. McEvoy won his second in 2016 and rides the favourite this year, Godolphin’s import Dubhe. Honor Babe’s lead up form were placings in the Epona Stakes and Chairman’s Handicap so Rondinella’s Group 1 weight-for-age placings are solid recommendations for her chances in an open race. Wellwood said with the promise of close to a good track and the inside alley he’s confident she’ll handle the extended trip. “It was her first time over a mile and a half but she acquitted herself well,’’ he said. “Obviously two miles is a different beast but she relaxes nicely and there isn’t any reason to think she won’t stay. Rondinella was on the $18 line with TAB on Wednesday with Dubhe $3.40. Wellwood has an interesting background, he grew up in showjumping and has been a bid spotter, he studied finance at university and was racing manager for Roger James for a year before starting the partnership. “It’s coming to the end of our first season and it’s been a good year so I’m very lucky,’’ he said. Meanwhile, Dubhe's trainer Charlie Appleby said he's been pleased with reports from Canterbury about his lightly raced four-year-old progress since he arrived almost three weeks ago. He's giving Kerrin McEvoy no instructions, given his long association with both Appleby and Godolphin, about how to ride Dubhe. "Kerrin had a sit on the horse on Wednesday morning and was pleased with him and is looking forward to the ride,'' he said.